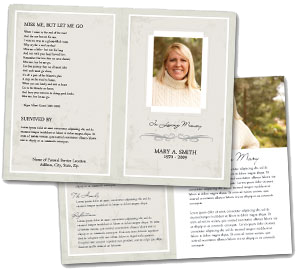 "Save Hours of Planning With Our Word By Word Guide"
This downloadable ebook of Sample Funeral Service Programs will help you create a memorable and personalized service for your loved one, that will be in a class of its own. 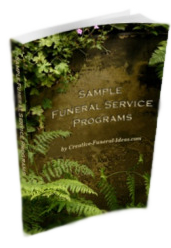 Our Sample Funeral Service Program eBook includes five funeral and memorial service programs to choose from, plus a selection of prayers, Bible Readings, Remembrance Poems, Funeral Readings and Quotations. We have a beautiful Spiritual Service that is non-religious specific but recognizes that there is a greater power. We have a suggested structure to follow for those wishing to organize a non-religious Memorial Service or Celebration of Life ceremony that is warm and friendly. Links are provided for additional help. It combines both a spiritual element to the service, with readings and psalms from the Bible, along with non-religious readings, including the Parable of Immortality. It ends with a favorite poem. We have included an outline of a typical religious portion of the service in the Christian custom. A minister or a priest may lead the service, however it is not absolutely necessary. If you prefer, it can be performed by any person outside of the clergy. Alternatively if the service is going to be held in your church, we have included the outline of a Catholic or Anglican service that is typically performed. Or maybe you have been thinking of a service in your home, or a graveside ceremony, or another location other than a church. In the times of our forefathers, having a funeral in the home, or at the graveside, was quite common. 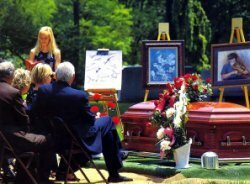 It has only been since the twentieth century that the funeral home has taken over the role, that previously was done by the family. 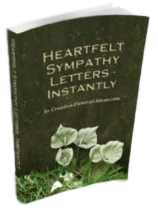 If you would like to hold a home funeral, there is no reason not to. We have provided a example of a home service. Or you may write your own service, adapting any of the services we have included. There are three dignified, and beautiful services for the Scattering of the Ashes. Like all classics, it transcends the boundaries of time and style. Two of them are religious, one is not. 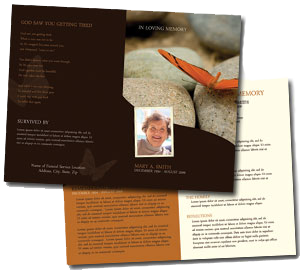 Anyone can give a Funeral Service Program. And that includes you! To receive your copy of Sample Funeral Services click on the link below. 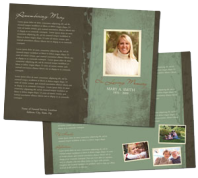 It will be sent to you in PDF format. Simply download and save it to your computer or print it. Your transaction is 100% safe.